Samantha Byrd is an excellent hunter, providing food for her family's table. She knows she will never raise her musket against a person. 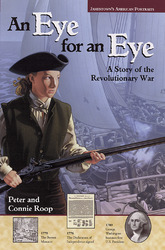 But when the winds of the Revolutionary War place her fingers on the trigger to shoot an enemy, will she pull it? In this story set in Virginia in 1775, a Virginia ripe for revolution, Samantha Byrd must decide whether or not to seek revenge-an eye for an eye.